In his 1690 Second Treatise of Government, John Locke set out a theory of ownership, by which property is created through the application of labour to the environment. But what happens to that ownership if such labour – such use of the property– thereafter fades? My presentation will examine the steps taken by place owners to symbolically and/or physically manage places which have ‘shrunk’ in the face of market contraction and other anxieties. I will draw upon two mundane case studies from my home city, Sheffield. One study concerns the slow redundancy of a failing country pub’s ‘beer garden’, and the steps taken by successive publicans to manage that peripheral, marginal space. The other, observes the locally-improvised steps taken by staff to hide ‘surplus’ space within a down-sized local supermarket. In each case a formal ‘legal’ reading of the ownership status of the pub and the supermarket would show no change in the abstract ‘bundle’ of rights held by each owner over these properties as static spatial co-ordinates, for these spaces do not ‘shrink’ in terms of their area or legal status. But there is a subtle, yet evident, process playing out in each case at the level of use. A part physical / part symbolic contraction which the formal gaze of law (or political theory) may struggle to name or acknowledge, but which none-the-less is a sign of our times, and a reminder that ‘ownership’ and ‘property’ are inherently unstable concepts: an unsteady mix of custom, bureaucracy and reaffirmation of ownership via use. Through exploring these case study examples, and their position at the outer-limits of effective ownership, we are given a glimpse of how ownership and territory are ordinarily silently made and re-made through practices of use, and of the habitual nature of many of those daily ownership rituals. One of the things that fascinates me is the after-life of abandoned bunkers, how they ‘live-on’ both materially and symbolically despite their abandonment and dereliction. Sometimes they live in ruin, sometimes they are subverted or converted. 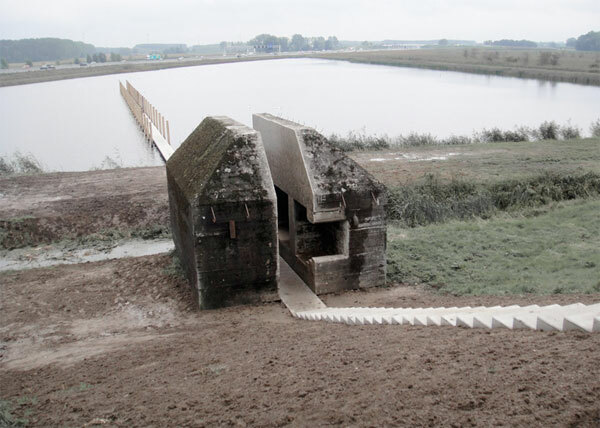 “The bunker is part of a system of 700 bunkers that made up the New Dutch Waterline– a Dutch military defense system that was in use from 1815-1940. The NDW protected the cities of Muiden, Utrecht, Vreeswijk and Gorinchem through intentional flooding, transforming the economic heartland of the Dutch Republic into an island, if needed. A family bereavement unexpectedly brought me back to Torquay this week, and gave me the chance to revisit some of my old childhood haunts. This essay describes a walk that I undertook one evening, and presents it as a reflection upon the creative meaning-making practice of walking and exploring edgeland hills and humps. Here, I will be presenting (and acknowledging) a form of ‘urban exploration’ that nods towards rambling, local history and psychogeography, but in which incursion and any physical endeavour was incidental and truly pedestrian. In the morning I had an hour free between various arrangement-making appointments and set off to reacquaint myself with a much loved childhood park. Strolling the hillside I climbed to a highpoint to take in a sea view that I knew would open up for me there. I’d spent many happy afternoons at the park with school friends searching with equal measures of enthusiasm and self-referential irony for UFOs and for farmers who might have spare buildings that we might be invited to build dens in. We found neither (and never really expected to). I’d also come to this vantage point with my (now recently deceased) grandmother, many times to watch firework displays over the bay. As I wandered around recalling these happy memories and their embededness in this place, I remembered that if I turned 180 degrees, to look away from the sea and towards the extremely rolling hills that undulated inland from this point, I would see a building on the horizon that had always captivated me, and which possibly is the origin point of the bunkerological urges that have (re) surfaced in my research activities in recent years. What I searched momentarily for, and then re-found, was a mile-distant hilltop structure comprising a large door, sheltered by dull grey revetments, flanked on either side by steep grassed banks. Standing thus on the far hilltop horizon the structure looks like a decapitated Mayan pyramid crossed with a Neolithic burial mound. To my once young mind, it had always looked like a bunker, specifically a Greenham Common-like hardened cruise missile silo. As a child I’d been fascinated by this place sitting at the edge of my known world. I had freedom to roam the suburban fields beyond this park, but not as far as this structure – for it sat amidst the dual carriageway of the town’s ring-road, an area beyond the realm of pavements. But now, as an adult, I was free to make my way there and finally meet this structure. Planning for my evening expedition, the most obvious route towards this structure was to follow the arterial road out west towards the ring-road. The sun was already low in the sky. 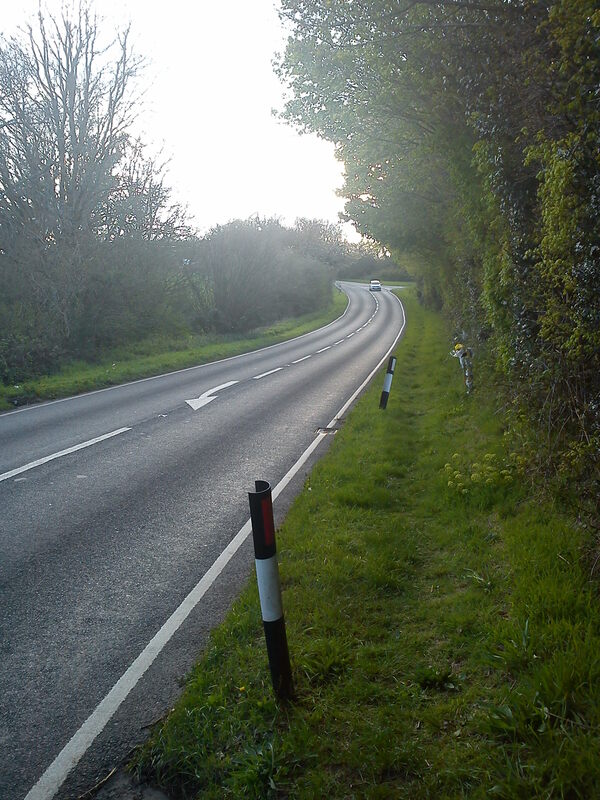 Following the road I soon reached the end of pavement, precariously continuing onward on along the verge, past makeshift accident-shrines (the cars were whizzing along this stretch) and toward the din of the dual carriageway. And soon, there it was. The humped bunker, and its door section, all fenced off from access and replete with security signs, barbed wire and overgrown remnants of previous boundary technologies (walls, ditches, pre-fencing and anti-personnel shrubbery). By the time of my arrival the sun was low (but still quite strong), the door now in shade. Rubbish conditions for getting a classy urbex shot. But I duly snooped around, clambered up a prickly bank and tried to see any sign of what these structures (for now I could see that there was more than one mound) actually were. But, I couldn’t get through. As I stumbled back down to the verge I was conscious of being the only person at large in this auto-world. Cars sped past, I avoided eye contact with the humans inside, trying to make my verge wandering as innocuous as possible. 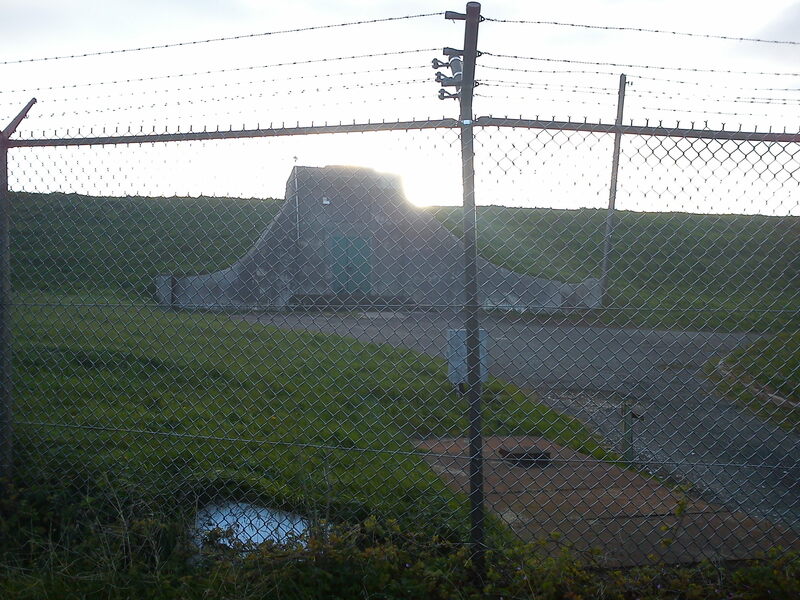 The building and its signs didn’t tell me this, but these ‘bunkers’ are actually covered service reservoirs, supplying the town’s water needs. They are covered because the water has already been treated to drinking water standard and needs to be protected against contamination. But if they are covered why the evident physical concern with preventing unauthorised access at the perimeter? Is Torquay really at risk of ‘fifth columnists’ with evil intent to poison the water supply? The reservoir is here, on Torquay’s highest hilltop for simple practical infrastructural reasons. Much as a ‘header’ tank needs to be at the top of a house so that gravity can give the supply sufficient pressure, so a settlement’s water ‘tank’ needs to have the best ‘head’. Just as upland valleys present themselves for catchment reservoirs, high flat hills are the best locations for these service reservoirs, these water bunkers. Thinking about this imperative got me on to the civic uses of hilltops generally. Across the road I found a cluster of notices directing me to the layered role and civic uses of the surrounding lay-by area. An island of human habitation. 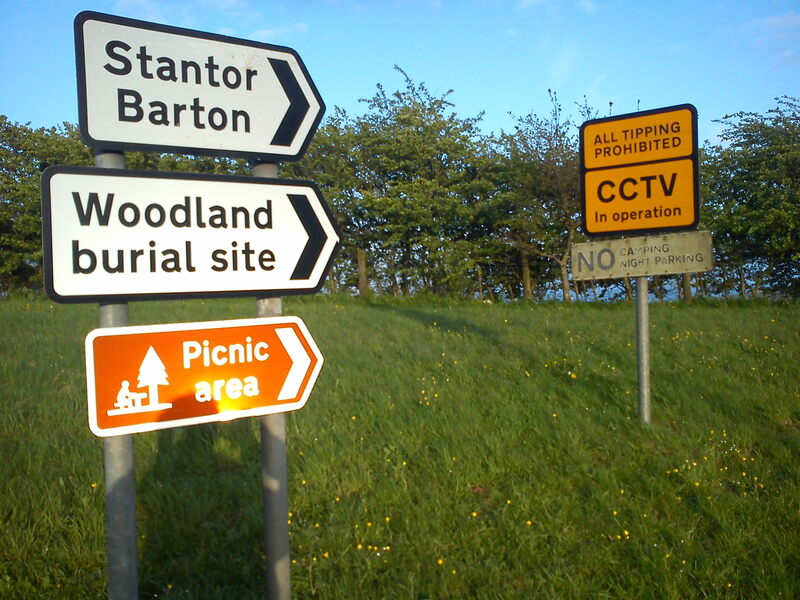 This place is variously a picnic zone, a scenic viewpoint, a car boot sale field, fly tipping blackspot, a dog walkers field and a recently added ‘woodland burial’ area. All of these uses (and their attendant signage) compete here for attention and dominance. Inside the burial field I encountered clear signs of tensions between the burial authority and the dog walkers. Freshly installed barbed wire fencing to the perimeter of the burial field suggested tensions too with the neighbouring farmer. 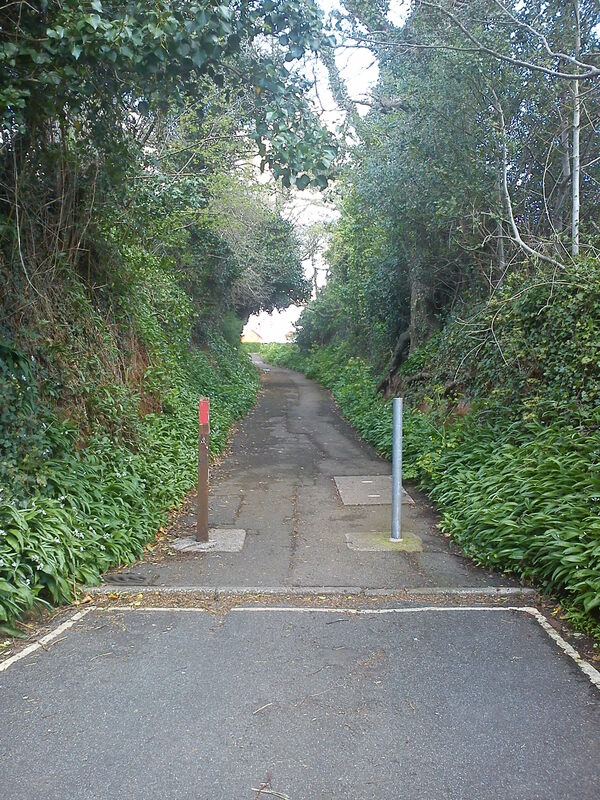 There were many instances of ‘well beaten paths’ abruptly truncated by these fresh, bitter (and sharp) interventions. 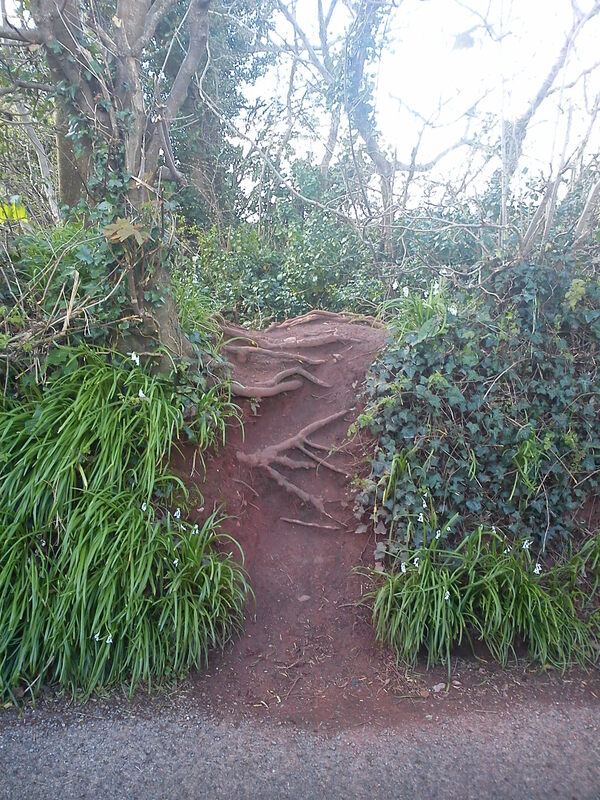 South Devon’s rich red earth screams out such pathways particularly loudly. The name of this hilltop is ‘Gallows Gate’. 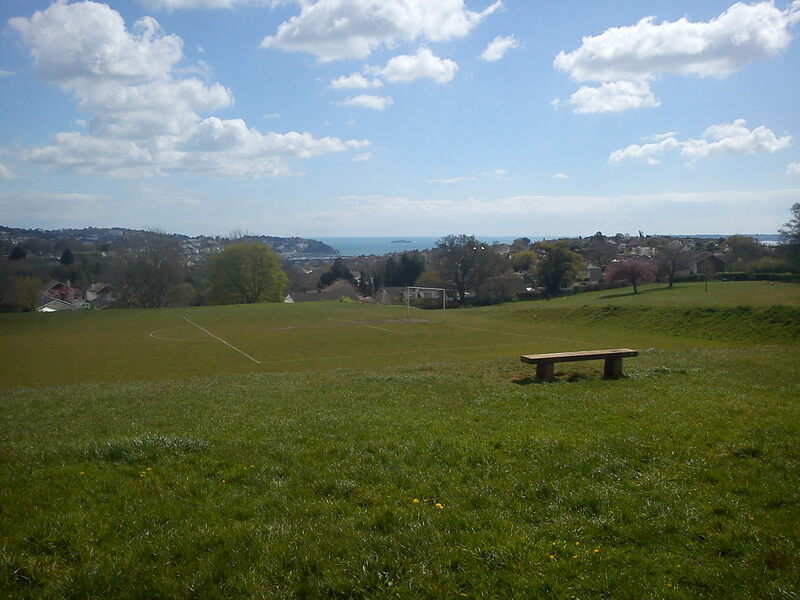 A civic plaque in the picnic area proudly commemorates the places at which the boundaries of four boroughs formerly met, prior to the formation Torquay Borough Council in 1892. The plaque snootily pours scorn on the local folklore that has it that the hilltop is named after an unfortunate sheep rustler who became entangled whilst carrying his stolen sheep over a local gate and lay there hung by his own greed. Instead the sober civic story is that of the site as the historic location of the local ‘hundred’ (ancient council and judicial forum). 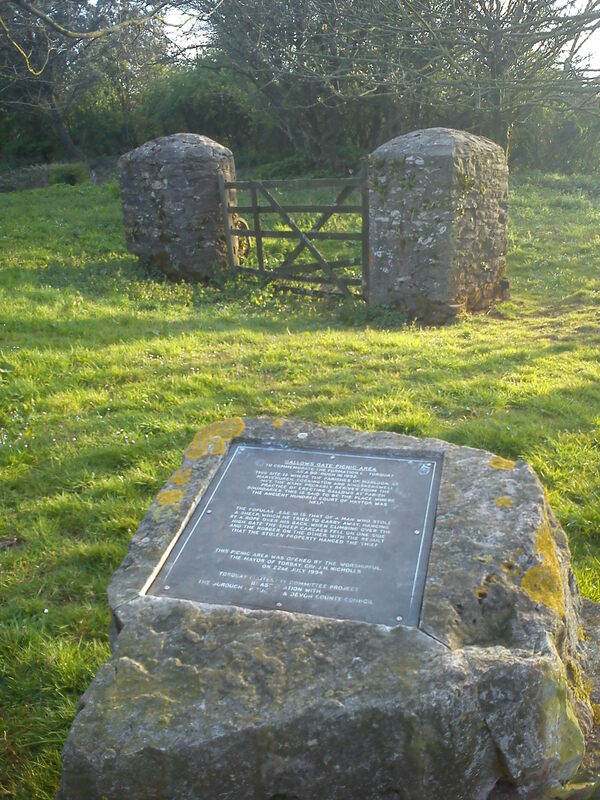 The plaque does acknowledge though that gallows were often to be found at the boundary of civic territories, adjacent to well travelled road or trackways and up high – all so that the fateful warning message of the condemned could signal widely the virtue of conformity to the law, and to the locality’s stomach for law enforcement (see Nixon 2012 for a fascinating account of the hill in this context). Meanwhile, South Devon’s hilltops also presented opportunities for message transmission networks – thus nearby ‘Beacon Hill’, part of an Elizabethan fire based signalling network (and now site of the local TV and police transmitter aerials). Elsewhere in South Devon ‘Telegraph Hill’ speaks to another iteration of hill-signalling – the Admiralty’s Napoleonic semaphone telegraph, based on a system of large moveable wooden panels capable, similar to old railway signals. This mundane hilltop has a quiet, but key infrastructural role in the water supply – life giving – cycle. And it, and hills like it, have been co-opted into abstract civic processes of war and peacetime communication, governance and punishment, commerce and leisure. So, where was Michel de Certeau that day then? Michel de Certeau died in 1986, so he was only with me in spirit on my walk to Gallows Gate. In his book, The Practice of Everday Life (1984) De Certeau writes of the role of ‘ghosts of the city’ – the power of physical and cultural fragments of the past to irrupt into everyday life and its places. But these ghosts are not confined to the city, indeed – as Dixon ably reminds us – such hilltops were places of execution and burial precisely so that the ghosts could be confined beyond the town (and its pavements). Whilst de Certeau and I may differ around the edges as the relative scope for the creation and defence of ‘private meanings’ I will park those issues for today. 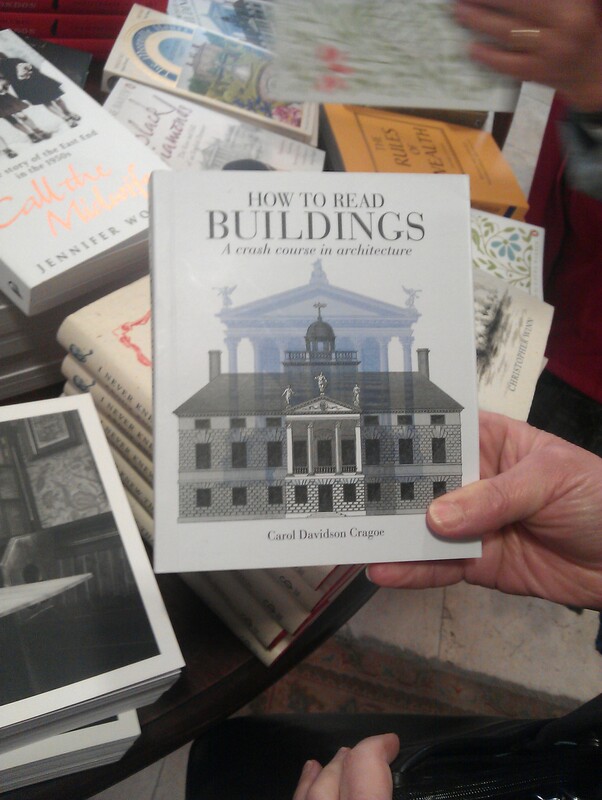 What I wish to draw upon are de Certeau’s optimism about the individual’s ability to enrich life and places via an active approach to the creation of sense and purpose. A key distinction drawn in his book is between the ‘strategic’ approach of systems and their planners in their attempts to order and direct life and place (e.g. making, running and defending reservoirs, roads and burial grounds) versus the subverting, adaptive and lived ‘tactical’ performance of life and place by individuals. Thus, this hilltop and its infrastructural features – whilst mundane in appearance to conventional aesthetics – can be actively imbued with rich meaning by a variety of individuals and groups through their chosen engagements with, and signification of things at it. Thus a web search tells me of trig point hunters and their collaborative desires to get into the reservoir compound and of the local historian keen to recall the grizzly layers of history of this place. Meanwhile my own visit reveals walking there as memorial enacted alongside dog walkers tracing their individual circuits around the burial field, the short-cut takers and their trails etched into red earth now frustrated by the freshly erected fencing. All of these are tactical engagements with this place. Indeed, my journey back from Gallows Gate was tactical in this final sense. Having eventually found a way over the fencing I set myself a challenge of finding my way home in as much of a straight line as I could devise from my childhood knowledge of the fields, pathways, lanes and settlements comprising the outskirts of this town. This modest dérive required me to walk perpendicular to the prevailing east-west valleys and their roads and pavements running towards the bay, and the centre of the town. This required active memory work (to recognise and remember the places I walked through) and spatial planning (to join those places together as a route). These tasks alerted me to something else that de Certeau (and I) have written about: the ‘erotics of knowledge’. The simple joy of mastering a thing, situation or a task through knowledge. As I cast my mind ahead yomping through these half-remembered fields and lanes I experienced momentary waves of satisfaction (and sometimes relief) that I had found a way through to the next stage of my journey home. Any wayfinder can recall this sensation. It’s the feeling of a plan coming together, of a task achieved, of a life presently and actively lived through knowledge and its pragmatic deployment. Mollie Germain (1918 – 2012). best and the worst of the world directly to her door. De Certeau, M. (1984) The Practice of Everyday Life, trans. S. Rendall, University of California Press, London. So wrote Georg Simmel in a 1903 essay considering the strategies by which the human individual defends himself against the domineering (and numbing) effects of urban living and its systems. But what if we turn this on its head and consider the strategies by which such systems adjust to individual human interventions which may threaten to disrupt their processes? In this essay I will try to explore this systemic adaptation in the context of railway suicide events. 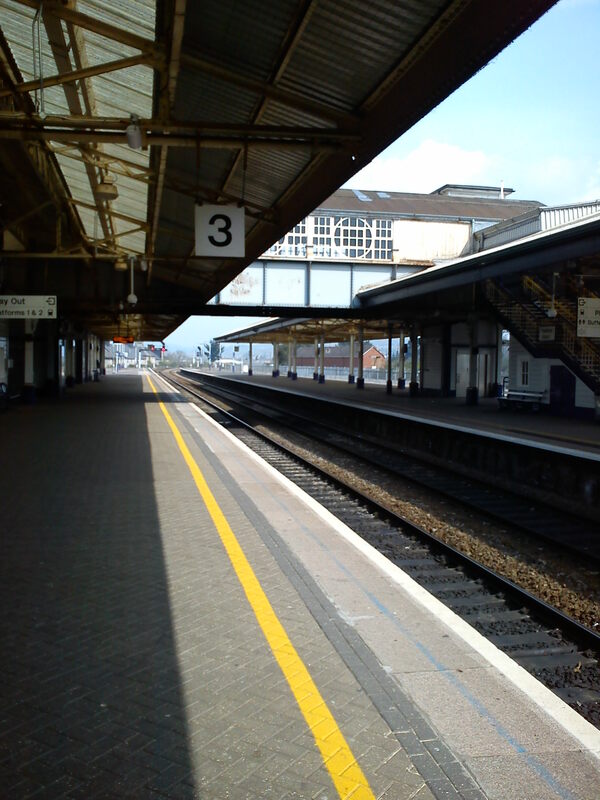 Is it possible to write respectfully about the infrastructural impact of railway suicides? I hope so. The following is not intended as insensitive. I’m heartened that the Samaritans, the UK’s suicide counselling charity urges writers to engage with suicide and break down its taboo, and that the subject is also an established fertile ground for medically inclined researchers (Samaritans 2008). But linking railway suicide and its knock-on logistical and infrastructural effects risks the opprobrium incurred by contrarian journalist, Jeremy Clarkson who declared on BBC TV’s The One Show last December that those who seek to end their lives via railway suicide are ‘selfish’ due to the ensuing travel disruption, and the distress caused to those who must witness and deal with the aftermath of such incidents. Clarkson’s comment was first made during the same TV appearance on in which he also remarked that strikers engaged in the recent UK public sector pensions protest strike should be shot in front of their families, as punishment for the disruption caused by their strike action to public services. Whilst Clarkson’s strikers comment was to ultimately cause greater public outcry, it was actually his comment on suicide that triggered an instinctive on-air apology to viewers by the presenter. In reaction the Samaritan’s Chief Executive attacked Clarkson’s comment, as revealing his ignorance about research into the motivations of those who seek to end their lives. She pointed to research that many who attempt suicide, do so in the belief that their families (and the world in general) will be better off without them – and that therefore the act may be seen by the perpetrator as self-less rather than selfish (Coleman, 2011). But Clarkson’s comment cannot be fully defeated by such research on motive – for his comment was about the effect of the suicide, the consequential disruption caused to the railway network in the aftermath of the incident. And this effect does exist, even though we may struggle to find a comfortable way to talk about it. The annual cost to the network of the railway suicide related disruption is £50 Million, with around 200 railway suicides per year (Samaritans 2011). A crude apportionment therefore suggests that each suicide ‘costs’ the network £250,000 (plus the non-financial emotional cost to those touched by suicide events). But it is unclear how the £50 million is made up – does it include ‘security’ costs? Is it purely response and aftermath of actual incidents? What of near-misses? And how far does the calculation trace the knock-on effects, the ripples into the lives and activities of the affected travellers? This essay was prompted by my experience of a recent journey from Sheffield to Devon. 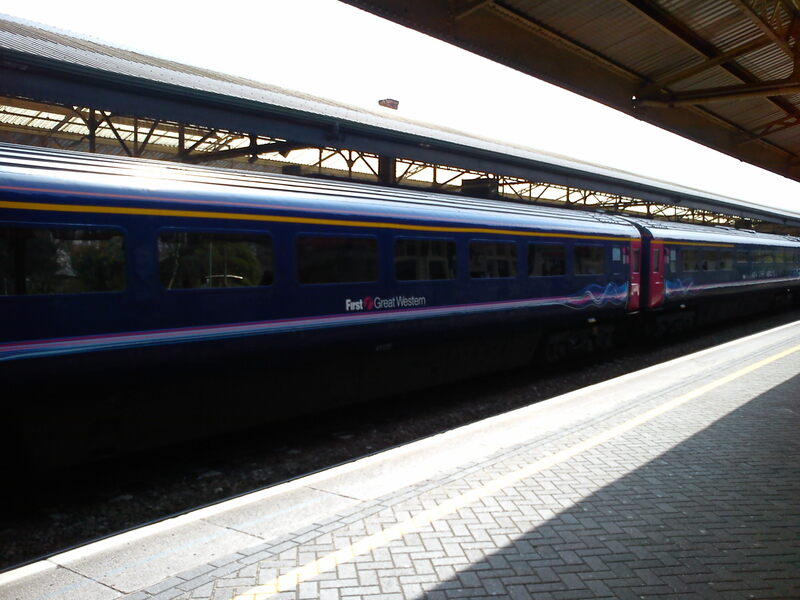 Our train arrived at Sheffield on time – but was two carriages short. The guard soon explained that this was a hastily despatched replacement train – the full length train having been halted earlier between Darlington and York ‘due to a fatality.’ Indeed having subsequently looked into the incident this portion of the line was closed to all traffic for a period to enable physical and forensic response to the incident. In the crowded journey that ensued, it was interesting to listen in to how, over the course of our four hour journey, successive train crews and the ebb and flow of passengers joining and leaving the service made sense of the train’s (slight) delay, its overcrowding and cancellation of seat reservations. In ‘passing on’ the story of this journey to new arrivals as the journey progressed, passengers dispensed with the carefully framed phrases of the guard and increasingly confidently announced – matter of factly – to their new companions that the travel problems were due to a suicide, before moving on to trade stories of consequential disruption to onwards connections. The passengers’ succinct discourse upon the cause of this journey’s character saw language attempting to bridge the humanitarian and the logistically frustrated. Here were people with disrupted journeys, missed connections, no seats trying to be both respectful to the suicide – in abstract and increasingly remotely –but also emoting against their predicament (and in a circumstance that blocked off the easy option of railing against the train operator). This got me thinking about the suicide’s ripple effect. The journey transmitted the very local, and very personal, fatal event in North Yorkshire down the backbone of the country, such that it could reverberate 300 miles away via missed connections in Plymouth. It also amplified the event in terms of the cast, the number of people involved. As travel plans were re-jigged, these ripples played out across a railway-day, the system’s equilibrium only being restored following the ‘down-time’ of the night. Yet, as with ripples on a pond the energy of the wave reduced as it fanned out. By mid route, most passengers had accommodated to their discomfort in this shorter-than-normal train. The suicide as root-cause became an abstract passing comment. The suicide event saw a life converted into a message on the line, but a message quickly attenuated by the system that it had caused some momentary perturbation to. The railway system transmitted the event, but in a way that stripped, normalised and ultimately absorbed it. I have no reason to doubt that even in today’s numbed world, such ripples would be similarly felt by those at or near to the event itself (although I do share Simmel’s general concerns about the numbing effect of metropolitan life – the ‘death of affect’ as J.G. Ballard termed it, the rise of a pervasive ‘ambivalence’ theorised in similar terms by Zygmunt Bauman). But, add 300 miles (and the time taken to travel on that distance) and voices become more muted, and themes more fractured, as the event fades in its visceral specificity. Watching this ripple-fade effect at a vantage point remote from the suicide event itself, left me wondering whether this muting effect is inevitable, necessary and/or appropriate. I have no clear answer, other than a managerial gut feel that there is a systems logic (a homeostatic effect) at work here, via a playing out of a utilitarian moral equation – that the ‘train on-time’ benefits for infrastructure users (small for each person, but large in aggregate across an entire journey’s user-population) and the enormity of the suicide event for those (in relative terms, few) emotionally or physically proximate to it, interact and ultimately resolve to produces plot points at which the extra-ordinary domain of the suicide event must progressively yield to the mass transit imperative. I’m left thinking that it is inevitable that people treat the event in an increasingly abstract and dispassionate way as time and distance work there attenuation effects such that the system (the rail network) and its users strive to restore equilibrium as quickly – and as respectfully – as possible. Clarkson advocated that trains involved in suicide incidents should continue their journey as soon as the line itself was physically cleared (and he graphically declared himself unconcerned with the fate of matter beyond the track: see Mirror, 2011), and I recall a BBC documentary last year on an Indian railway upon which fatalities appeared an almost daily occurrence, and a dispassionate ‘clear the track and carry straight on’ ethos appeared very much to the fore. I wouldn’t feel comfortable with that, but accept that the system must carry on and maintain equilibrium. But where should the precise point of balance be struck? How much delay is respectful? How much is a careful causal, forensic site analysis worth? How utilitarian should the calculation of the imperatives of continuation be? 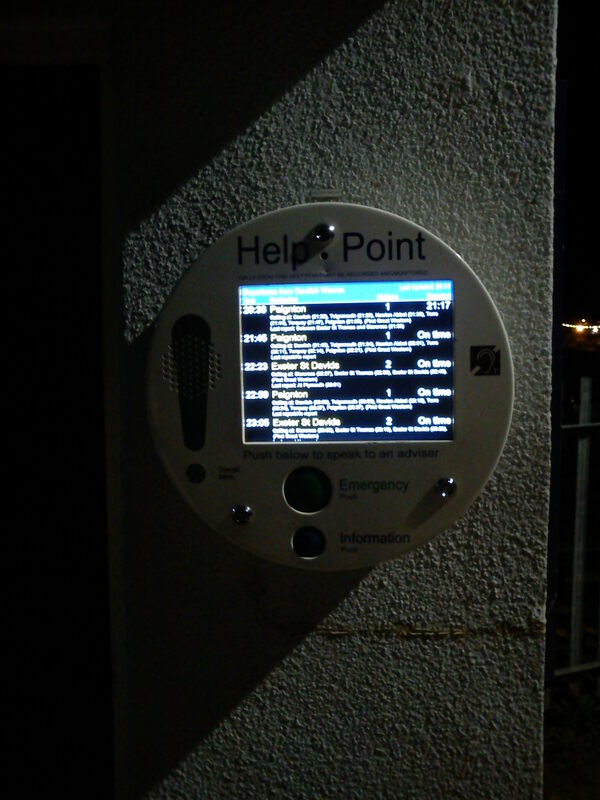 How much should travellers pay towards addressing suicide and other incursions to the railway network? All are questions with no right answer – yet making no decision upon them is not an option. The UK approach represents a set of operational and policy decisions, embodying explicit and implicit judgments about how the individual vs system rights and benefits can best be balanced. It is one balance-point, but as the Indian example shows (and as Clarkson contends), it is not the only possible balance-point. Simmel wrote in his essay of the strategies developed and deployed by the individual to resist being “levelled, swallowed up in the socio-technological mechanism” (70). This Simmel quote can also be flipped, and applied to the railway system’s own defence against the incursive acts of the human individual, and whether as metal thief, urban explorer or potential suicide. Railway intrusion incidents and fears contributed greatly to the evolution of both railway safety legislation and occupiers’ liability jurisprudence during the twentieth century (on the latter see Bennett 2011). 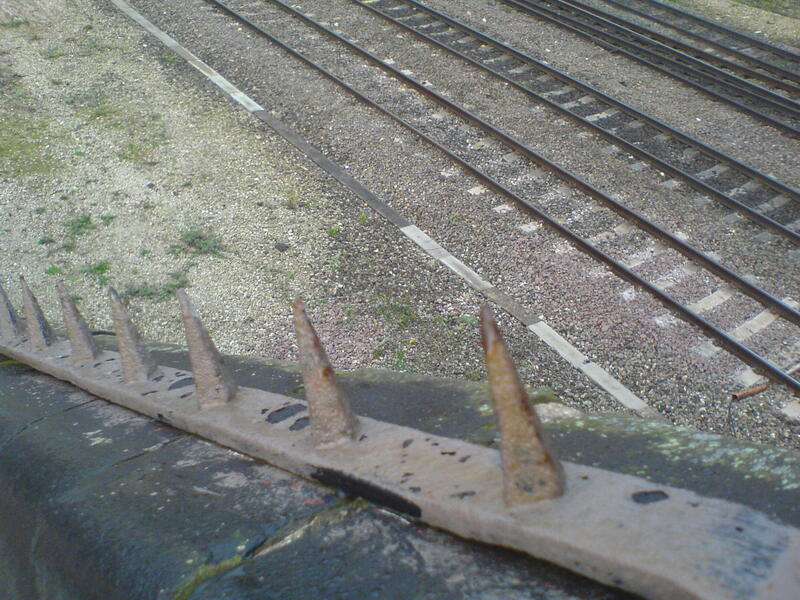 On the policy side, the House of Commons Transport Committee’s recent recommendation of a specific new offence of trespass upon railway property (prompted by rail cable metal theft); the earmarking of railways as ‘critical national infrastructure’ (e.g. by CPNI) ; and, at EU-wide level, the major collaborative RESTRAIL (REduction of Suicides and Trespasses on RAILway property) research and best-practice promoting project which commenced in 2011 (www.restrail.eu) are all examples of a heightened current focus upon defending railway infrastructure against incursions and their ripple effects. And there are some signs that this heightened focus may be bearing fruit in relation to suicide related railway incursions. In 2010 Network Rail announced its £5 million partnership with the Samaritans aimed at reducing railway suicides by 20% by 2015 via a programme of public awareness and ‘front line’ staff training and support (Network Rail 2011). Review of the first year of the programme suggested that the programme had contributed towards the 11% fall in the UK rail suicide rate reported in the Railway Safety & Standards Board’s official data (Samaritans 2011) – although it should be noted that the baseline year (2009/10) was 13% higher than the nine year average presented in RSSB 2010, so any conclusions on the ‘success’ rate of such programmes have to be tentative at this time. Garfield, S. (2002) The Last Journey of William Huskisson, Faber & Faber: London. Network Rail (2011) Network Rail Infrastructure Ltd Annual Reports & Accounts 2011, Network Rail: London. Railway Safety & Standards Board (2010) Annual Safety Performance Report 2009-10: a reference guide to safety trends on GB railways, RSSB: London. Available at: www.rssb.co.uk. Samaritans (2008) Media Guidelines for reporting suicide and self harm, Samaritans: Ewell. Available at www.samaritans.org. Samaritans (2011) Reducing suicides on the railways – Samaritans’ partnership with Network Rail – Media Briefing, available at: www.samaritans.org. Simmel, G. “The Metropolis and Mental Life” in Leach, N. (ed) (1997) Rethinking Architecture – a reader in cultural theory, Routledge: Abingdon. Dealing with sliders: law vs technology? 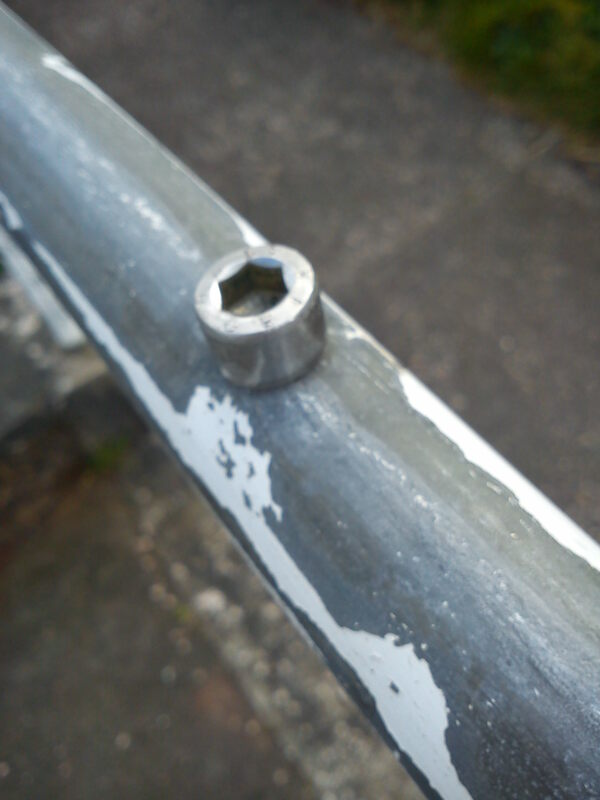 Yet, if you had a problem with people using the banister rail in an unpermitted manner it’s unlikely that your first instinct would be to seek a remedy through the courts: an injunction forbidding future trespassing uses of the staircase and its polished surfaces. No, perhaps the first instinct would be to defeat the slider by technological means. 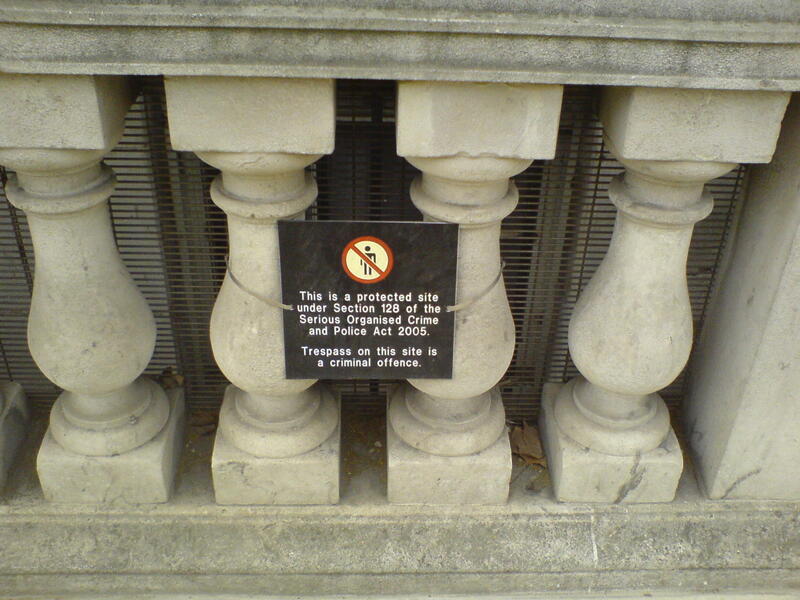 I have here in mind small brass nodules intermittently inserted along the length of the balustrade. A simple, but effective (and potentially painful) deterrence technology. The picture here is from one of the older buildings of my University, a late Victorian hall. Evidently sliders were a problem here at some point in its past. These nodules have caught my eye because I’ve been thinking about the role of subtle physical devices as limiters of pedestrian passage and use. The anti-slider nodule has a close relative in the anti-sitting nodule, commonly found deployed to deter posteriors from enjoying a relaxing flat surface on plinths beneath the grand archways of banks, town halls and other grand buildings which seemingly might otherwise be despoiled by the loitering recumbent. It also has an echo in the laying of jagged pavers to ‘forbidden’ parts of highway ‘central reservations’. These physical features won’t hurt, as such, but they will deter the pedestrian towards more accommodating and permitted pavements, or simply keep people moving along. They also have larger cousins in the form of bollards, and their selective urban sieve function: to block vehicles, but not to hinder that vital free flow of pedestrians. And I’m not saying that brass nodules are alternatives to law – rather I am asserting that they are part of law itself. Frequently such features will be deployed under authority of legal powers (e.g. 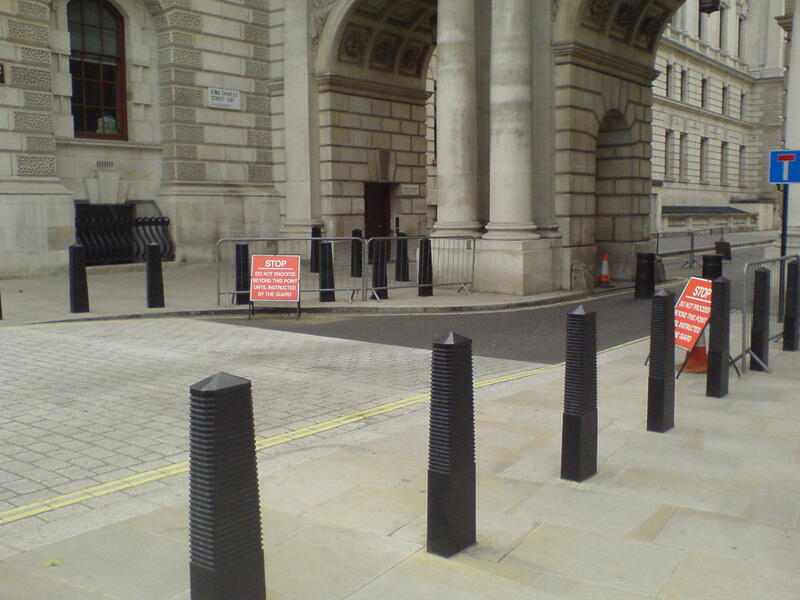 bollards) or envisaged as part of a strategy of managing something inherently legal in nature – whether property rights of fear of liability for harm otherwise caused to a potentially loitering public. To perform law’s territory forming tasks, physical artefacts will often be deployed as an expression of and/or through a process of law. In decades gone by, it was quite common to inset broken glass on wall-tops to deter intruders. Such technologies are now considered by law to be disproportionate. 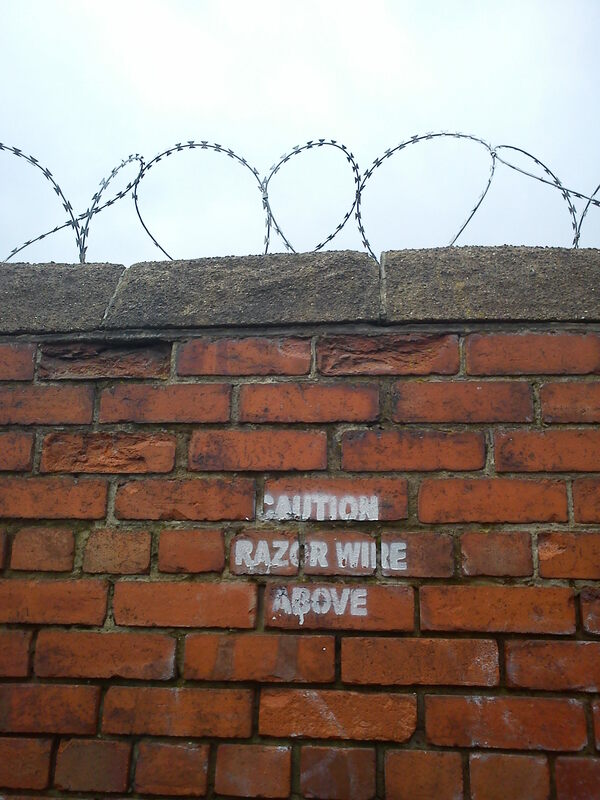 Likewise, razor wire – whilst tolerated by the law – must not be concealed and warning notices must be posted to draw attention to its presence. Since 1984, even a trespasser has a right to reasonable bodily protection against foreseeable injuries from features deployed there. Injured sliders: who’s to blame? 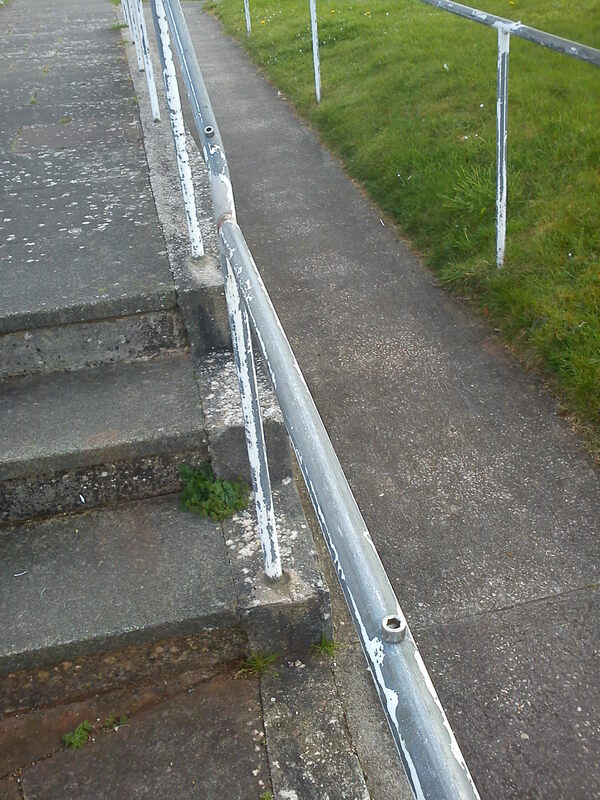 But, English law does not offer trespassers protection against freely accepted risks – there is no obligation to stop banister sliders from undertaking their perilous decents (except perhaps a duty for premises owners to safeguard those bystanders who might be injured by a falling slider). A succession of court cases over the past decade have shown that premises owners do not have legal responsibility to protect adult visitors or trespassers who seek to use the built environment in ways they were not designed or intended for (and often this logic is applied to children too). Thus compensation claims for recreational injury sustained whilst diving into shallow bodies of water, using buoys and groynes as diving platforms or climbing the underside of a fire escape gantry have all failed, for there was nothing wrong with the state or management of these structures, instead in each case the danger was created by the victim’s decision to use these structures in alternative, unintended and unpermitted ways. Which brings me back to banister rail sliding. Lord Justice Scrutton’s banister sliding metaphor remained just that, a metaphor, until it became axiomatic and very pertinent in a case heard last year by the High Court in Newcastle, Geary. The case concerned a women left paralysed and wheel chair bound by her decision to slide down the balustrade of a Newcastle pub, The Union Club. That pub, was situated in an “opulent Victorian clubhouse, centred round a stone staircase leading up to a half landing with two returns on either side going up to the first floor” (Geary 2011: para 6). The court heard evidence that this lady had – whilst sober – chosen to slide, but misjudged the manoeuvre and fell four metres onto the marble floor below. The lady had been heard by a number of witnesses declaring (en-route as she successfully navigated the first stretch of balustrade) that she was emulating Mary Poppins’ famous stair sliding endeavours in doing so. 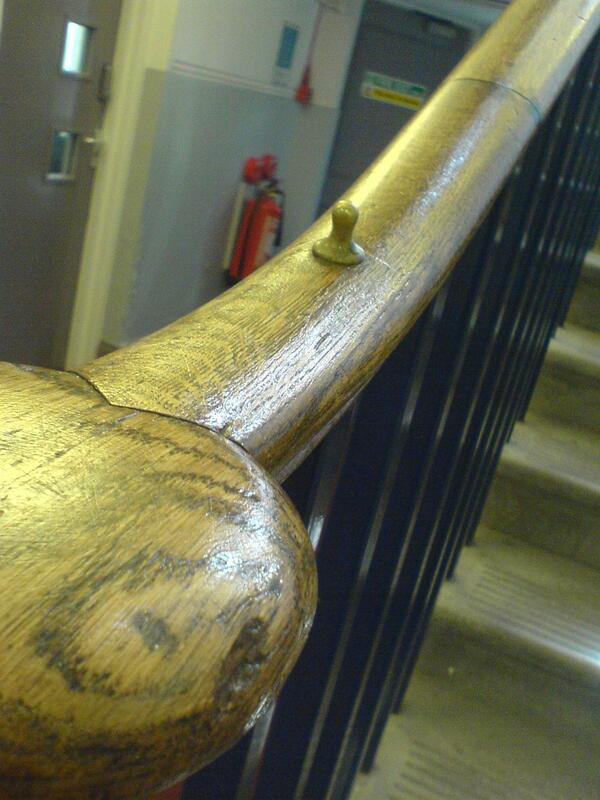 The crux of the claimant’s case was that although she accepted that she was partly to blame in freely choosing to expose herself to the inherent risks of banister rail sliding, there was an additional obligation on the pub owners to protect her from her own temptations – and that the presence of a nice smooth, un-nodulated, balustrade was evidence of their failure to adequately meet that duty to protect. Here the claimant’s case came close to reviving the so-called ‘doctrine of allurement’, a judicial device of some vintage, by which judges sought to find routes to compensation for claimants by accepting that in certain circumstances some physical features summon people – like the Sirens’ call – such that they are drawn uncontrollably towards them and their danger. But this doctrine never took a clear hold in English Law, and whilst it had more success in the US courts it was rarely extended to adults. The English courts are not particularly amenable to arguments based upon imputing agency to lumps of metal, wood or stone, no matter how artfully or ingeniously combined. For more on this see Bennett 2011. But interestingly, the judge did in Geary have more time for something similar (and more helpful to the property owner) – a notion of auto-suggestion, when he noted without criticism that the pub owners had considered erecting a warning sign, but had decided against this course of action on the ground: “that it would attract more people to the possibility of sliding who hadn’t otherwise thought of it” (Geary 2011: para 21). The judge in Geary drew upon the weight of recent judicial pronouncements to comprehensively reject the claimant’s claim, quoting Lord Justice May’s ruling in the 2008 Court of Appeal case, Poppleton that: “adults who choose to engage in physical activities which obviously give rise to an unavoidable risk may find that they have no means of recompense if the risk materialises so that they are injured”. Thus, the judgment concluded that the pub owner had no responsibility to prevent the claimant from suffering the injuries that she did. 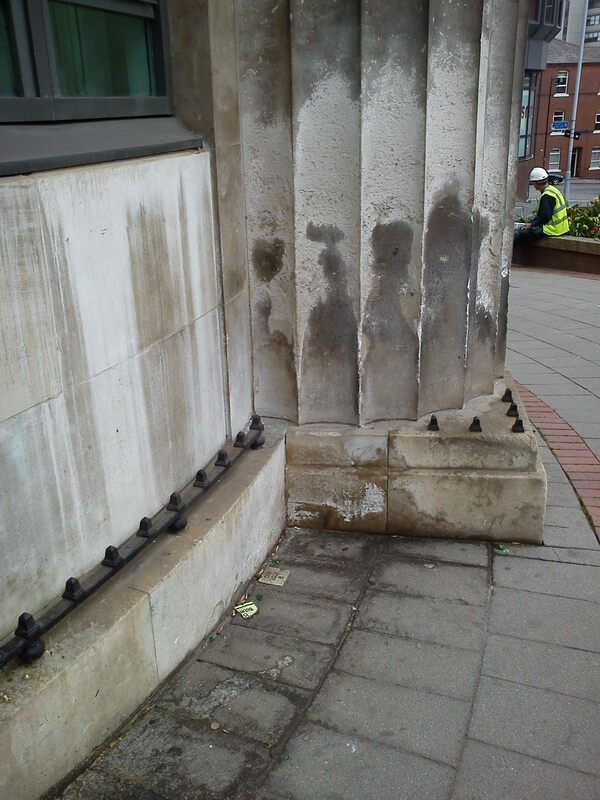 It also reports that following this serious accident the pub applied a cheap cost (£300) physical measure – wrapping a length of thick rope along the length of the balustrades, thereby obstructing the baluster to sliding. 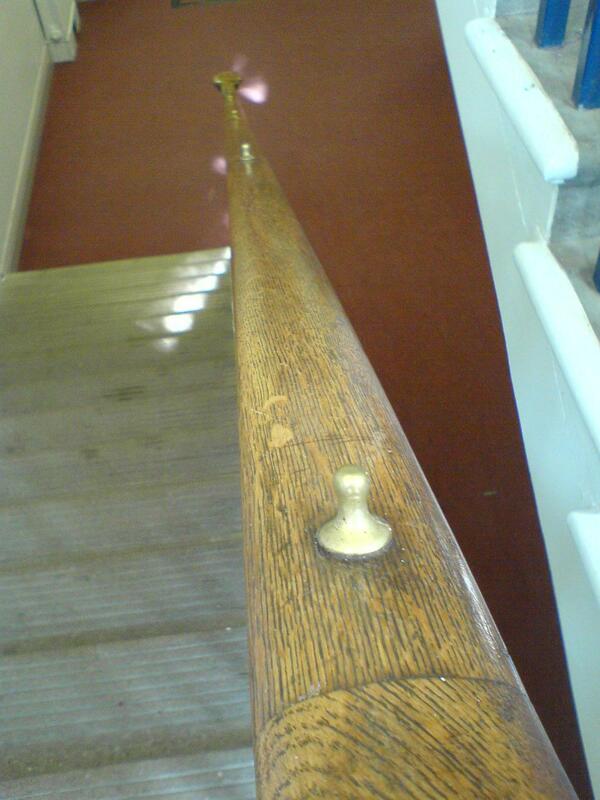 Brass nodules were not an option in this instance due to sensitivity by English Heritage to the building’s listed building protected status (which had also led to the retention of lower than normally permissible banisters, a factor which the judge acknowledged as having made the balustrades easier than normal here to mount and slide). So, banister sliders beware. You are on your own. Owners have no legal obligation to save you from yourself. They do, however, have a duty to protect bystanders from injury by your fall, and balustrade nodules, sturdy rope or some other friction denying or passage disrupting technology may be the best way of discharging that legal duty. Hogg, R (2002), “Law’s other spaces”, Law/Text/Culture, Vol. 6: pp. 29-38. Trustees of the Portsmouth Youth Activities Committee (a charity) –v- Poppleton  EWCA Civ 646.